SEM Link hosted a Teen Science Café on Friday, July 27th at the Summer Institute for the Chief Scientific Officer Program. 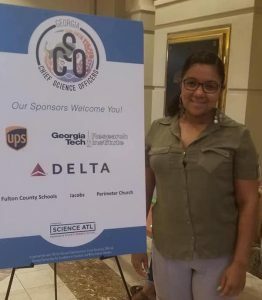 The Chief Scientific Officer program is a program of the Atlanta Science Festival, in which middle and high school serve as leaders in their schools. Hence the name, Chief Scientific Officer. The purpose of the program is to engage their peers in hands on STEM and STEM career exploration activities at their schools. 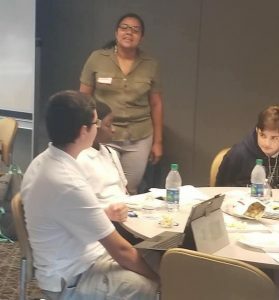 The speaker for the Café, was Ms. Deborah Ortiz of the Environmental Protection Agency (EPA), who has served as a speaker for SEM Link’s Teen Science Café. Ms. Ortiz talked to the students about her journey to become a STEM professional and how she was interested in STEM and attended STEM programs as a child growing up in the San Francisco Bay area. She also talked to the students about the history of the EPA and the work that the EPA does to protect the environment. She continued with discussion about her work in the EPA which includes environmental testing and helping communities in the EPA region 4, which Atlanta is in. Here she helps create solutions to solve environmental problems in the area. The coolest thing about the café was the students interest in the work of the EPA and how they can solve the environmental issues in the communities where they live. They were also given information on which agencies they can report any pollution that they see in their community. The teens had a lot of questions about Ms. Ortiz career and the work of the EPA. The majority of the café was spent with the students and Ms. Ortiz talking about what the kids can do to conserve energy and reduce and report pollution in their communities. Ms. Ortiz’s activity was called Non-Renewable vs Renewable energy. 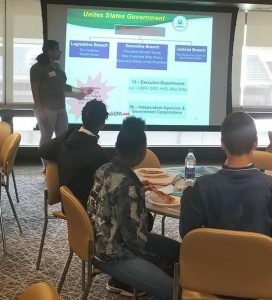 The purpose of the activity was to teach the teens about the importance of conserving non-renewable resources. Ms. Ortiz divided the students in 4 groups of different sizes (the groups had 3-6 teens). She used popcorn (as the non-renewable energy source). The goal of the activity to teach the students how to make decisions about the use of their resources. The group had to decide how much of their resources that they are going to utilize and how much they will conserve. The activity went well because the teens learned a valuable lesson about conservation of resources. It also helped them to understand non-renewable and renewable resources. It also helped the teens the understand the impact of society’s use of resources.